Will Alaska’s weird winter be followed by equally strange summer? After an odd Alaska winter of record-warm temperatures and pouring rain instead of snow, will summer be weird as well? 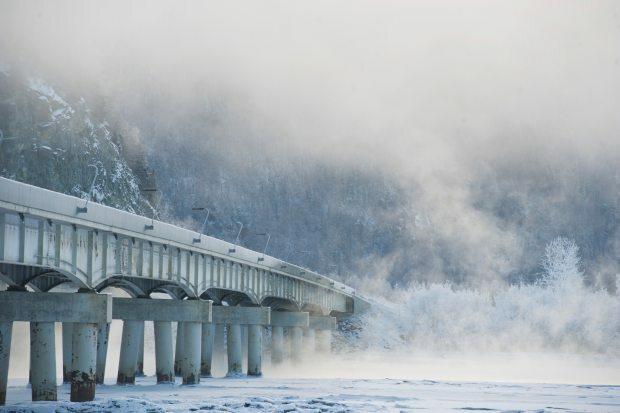 While scientists say more such winters can be expected in Alaska in the long term as the climate heats up, predicting what will happen in the short term is iffy. Still, resource managers are making some contingency plans for a challenging summer, and scientists have some advice in case the next few months are as unusual as the last few. “Basically, all of the tools that we have at this point are pointing to a warmer-than-average summer,” said Rick Thoman, a Fairbanks-based climate science manager with the National Weather Service. Sea-surface temperatures in the Gulf of Alaska and North Pacific Ocean are far above normal, and ice extent in the Bering Seais below normal, factors that “tilt the odds” in favor of a warm summer, he said. But predictions for summers are tricky, as they are influenced much less by large-scale systems than winters are, he said. There is no question that current conditions in much of the state are dry — not necessarily because of lack of precipitation but because, at least south of the Alaska Range, “much more of the precipitation that has fallen this winter has been rain instead of snow,” Thoman said. Snowpack, as measured by water content, was extraordinarily low in Southcentral and Southeast Alaska, according to National Water and Climate Center data. Anchorage, the Copper River Basin and Southeast Alaska on Friday had less than half their normal snowpack for this time of year; snowpack was 30 percent of normal in the southern Kenai Peninsula and 25 percent of the norm in the southern part of the peninsula, according to the center. Such snowpack conditions usually foreshadow an early — though not necessarily abnormally large — wildfire season, Thoman said. There is no correlation between snowpack and overall extent of annual wildfires, although the correlation with early fires is very strong, he said. There were similar dry conditions last year, and a resulting early start to the fire season, according to the Bureau of Land Management. Early wildfires are precisely what federal and state wildfire-management agencies are expecting. The agencies are gearing up a month early for the season — something that has become a new pattern. 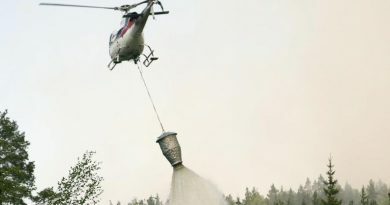 “In recent years we’ve been trying to ramp up preparations earlier in the year because they seem to be happening earlier,” said Tim Mowry, a spokesman for the Alaska Division of Forestry, one of the agencies that make up the integrated state-federal wildfire organization in Alaska. The official start of the fire season — the date when burn permits are required — is now April 1 rather than May 1, a change made a few years ago, Mowry said. And this year, a smokejumper crew and plane are scheduled to be on duty by April 9, a month earlier than normal, he said. Even in winter, there has been threat of wildfire, including the winter of 2013-2014 as well as this past winter season. That is a recent development for fire managers, Mowry said. “There isn’t usually grass showing in January,” he said. If trees don’t burn in wildfires, they still might be vulnerable after a warm, snow-sparse winter, said Glenn Juday, a forest ecology professor at UAF. Temperatures warm enough to cause some trees to bud in late winter were interrupted by brief snaps of ultra-cold weather, a pattern that can take a toll, Juday said. “This is exactly the mechanism that led to the yellow-cedar decline,” Juday said, referring to the long-term massive die-off in Southeast Alaska and British Columbia attributed to a climate-warming-related lack of snow cover. Trees can respond to warm winter temperatures by losing their winter hardness and starting to grow, as if it were already spring — only to be killed by a brief, sudden return to normal winter temperatures, he said. Trees’ fates in such situations depend a lot on their species. Willows, which can bud early, are resilient when refreeze conditions occur, Juday said. But research in Canada found that some other species — trembling aspen and quaking aspen and balsam poplar — are more vulnerable. There is also the threat of insect infestation, which rises as winter temperatures do. The spruce bark beetle infestation is a prime example of warm-winter effects, and the invasion of amber-marked birch leaf miners may also be tied to warmer-than-normal weather, Juday said. “Any number of times in the past, people have said, ‘Well, it will get this far, and then it’s just too cold,’ ” he said, but now the amber leaf miner invasion, which started in eastern Canada, has reached Fairbanks and Interior Alaska. Keep an eye out for the spruce budworm, he warns. The budworm has infested Alaska trees in the past, and in recent years has taken a big toll on forests in Canada, reaching as far as the Northwest Territories. Altogether, heat, lack of moisture and insects can combine to make life difficult for trees, Juday said. What about mosquitoes, sometimes called Alaska’s unofficial state bird? There is no Alaska mosquito census or population estimate, Sikes said. “You can always say that in Alaska there’s a lot of mosquitoes, so it’s always a bad year. But some years are worse,” he said. Whether this will be one of those worse years depends on spring weather, “so if you can forecast the weather with great precision, you can attempt to forecast mosquitoes,” Sikes said. The biting insects are aquatic, so a wet spring with lots of puddles will mean more growth and a dry spring would mean fewer, he said. A dry spring, however, could boost populations of another annoying insect, the yellow jacket. 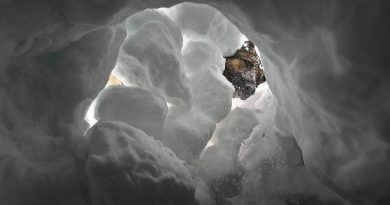 For insects in general, a low snowpack coupled with bitter winter cold would be expected to hurt populations because they use snow as an insulator, Sikes said. But low snow and mild winter temperatures, as has been the situation in Southcentral Alaska, would probably leave insects unscathed, and perhaps would be good for them, he said. Another prediction: Big animals will be astir early, and they will be roaming around in greater numbers in the summer. If a warm and more rainy-than-snowy winter means green shoots will emerge early, expect hibernating bears to do the same, said one state biologist. “Hibernation is not really a reaction to cold. It’s a reaction to lack of food,” said David Battle of the Alaska Department of Fish and Game. More moose than normal might be roaming around too, Battle said. “This has been a pretty good winter for moose. They could have wandered off pretty much anywhere they wanted to,” he said. They did not have to spend their energy slogging through snowdrifts, getting cornered in punchy snow by attacking wolves or forced into dangerous roadways to move around — all positive indicators for good winter survival. Fish in rivers and streams, however, may not be so plentiful. Water could be low in rivers and streams that are fed by melting snowpack, said Shane Hertzog, a technician with the Alaska Department of Fish and Game’s sport fishing division. That was the case last summer for the Kenai Peninsula’s Russian River, a sport fishing hotspot. “It was one of the lowest flows that we’ve seen” — a condition directly attributed to low snowpack, Hertzog said. Sparse snowmelt can be dangerous when combined with higher-than-normal air temperature, he said. “Temperature can increase to a point where it can be lethal to salmon,” he said. Glacier-fed rivers and streams, in contrast, can run high when weather is warmer than normal. But sometimes, snowmelt and glacier melt feed the same water bodies, although at different times. That was the case last year with the salmon-rich Copper River, which early in summerwas “lower than anyone remembers until conditions changed abruptly, Hertzog said. “It got really hot really quickly and the Copper rose substantially, and you got floods. We went from one extreme to the other,” he said. Hertzog, who has already been fishing this year on the Kenai Peninsula, said he still has high hopes for summer despite winter’s weirdness. “I’m not all doom and gloomy. I’m hoping for some more snow and, if not, some rain,” he said. Who’s the toughest Iditarod musher — and why?